At SXS Fitness we believe that one of the best ways to create a healthy fitness environment is through word-of-mouth. We also like to REWARD our clients for referrings us. Bringing in new clients that share a similar passion to improve their Fitness & Wellness levels makes our job easier. 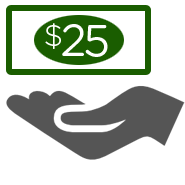 For every friend that you refer who becomes a new paying client, we will credit your account with $25. You can use this credit for any Services at SXS Fitness including: Personal Training, Group Fitness, Wellness (Naturopathy, Acupuncture, Massage Therapy). Read the details below to learn how to qualify for Referral credit - and thank you for referring us! Tell a friend to purchase at least $100 for Services at SXS Fitness (or send them a link to this page). They can purchase Group Fitness, Personal Training, or Wellness services. Notify us of the transaction and request that the Purchase be transferred to a new client - we will setup the account for them. Enjoy the benefits of private or semi-private training with a certified instructor. Choose from any of our classes including: CrossFit, TRX, or Cross-Cardio. Take care of your helath with Treatments, Assessments, Acupuncture, or Massage.